iV3 PCB line vacuum cleaners are the most powerful among the wheeled vacuum cleaners and are utilized for the collection of chips and dust in the drilling machines and large milling machines (6-8 spindles). These industrial vacuum cleaners can be used, in their customized version, also with frequency inverter and be transformed into real centralized vacuum systems. Both in Europe and in the United States, but also in the countries which become a leading manufacturer of PCBs since the 2000. The waste generated on drilling or milling machines require effective and constant industrial aspiration in time, so as to be able to guarantee quality to the final product, the PCB (Printed Circuit Board) must ensure minimal tolerances (in terms of Micron) and during their processing, be completely free from chips or dust removed, thanks to the latest technologies available on the iV3 PCB vacuum cleaners all of this is possible. In addition to the industrial vacuum side channel turbine, iVision has designed, produced and patented a range of special accessories for the printed circuit industry that make all our products ideal and indispensable for all PCB manufacturers. All iV3 PCB line vacuum cleaners have been carefully created, designed and produced to live up to the growing needs of our customers. In the PCB world iVision is becoming efficiency and technology synonymous. The iV Custom PCB vacuum consist of a cyclonic prefilter, a central unit with turbine, an integrated filter, an electrical panel with inverter and all necessary components in the management of PLC control with color screen. The system is also equipped with a powerful silencer to ensure full compliance with international standards. The iV Custom vacuum cleaners are, for all intents and purposes, a centralized system and are among the most technologically advanced systems available on the market, and are not comparable to any of the traditionally known systems. The long experience of iVision staff, as well as a willingness to meet customer demand, have led to the development of high-tech products as well as customized solutions. Thanks to a frequency inverter of these filters iV Line Custom PCB can manage as efficiently as 15 CNC machines simultaneously. A sophisticated control sensor (optional) is able to measure the deterioration of the filter of the vacuum cleaners. iV Custom PCB, greatly reducing maintenance and ensuring a steady income and a permanent central vacuum. A dedicated control system, which allows control of all functions, allows iVision to be the only company in the world that can offer optionally up to a 5 year warranty on the entire centralized system. 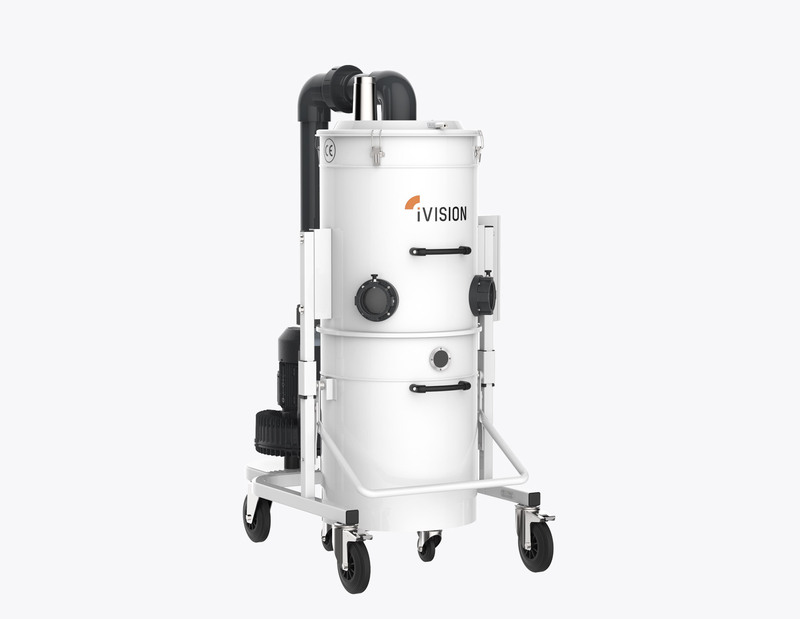 IV1 PCB line vacuum cleaners are the most compact of the iVision range. We have produced a specific range of industrial vacuum cleaners with side channel turbine, used with great success in the world of PCB manufacturing. The waste generated on drilling or milling machines require particularly efficient and constant industrial aspiration for a final product, precisely called PCB (Printed Circuit Board) that guarantees of micron tolerances and that during its processing is entirely free from chips or dust. In addition to the wide range of side channel turbine vacuum cleaners, iVision has created and even patented a range of special accessories for the world of printed circuit associated to IV1 line PCBs, which make our products the best solution, and indispensable for all PCB manufacturers. The very low noise level, ease of maintenance, as well as the design and use of Italian products, are the key features of iVision industrial vacuum cleaners. IV2 PCB line vacuum cleaners are the best sellers among the wheeled vacuums of the iVision range, and are used for intensive collection of chips and dust generated by the drilling and milling machines with 2 to 6 spindles. This new and innovative range of industrial vacuum cleaners with side channel turbine, is used with great success in the world of PCB manufacturing in Europe, the USA, and in Asian countries led by China and South Korea. The waste generated on drilling or milling machines require a particularly efficient industrial aspiration and especially constant for a final product, precisely called PCB (Printed Circuit Board), which guarantees the minimum tolerances (in terms of Micron) and that during its processing is completely free of chips or powder, this is an obtainable condition thanks to the latest technologies available on the iV2 PCB vacuum cleaners. In addition to the already wide range of vacuum cleaners with side channel turbine, iVision has also developed and patented a range of special accessories for the printed circuit industry that make our products, quieter, simple and economic in the maintenance, ideal and indispensable for every PCB manufacturer.